Prepare yourself for whole other level of cuteness. 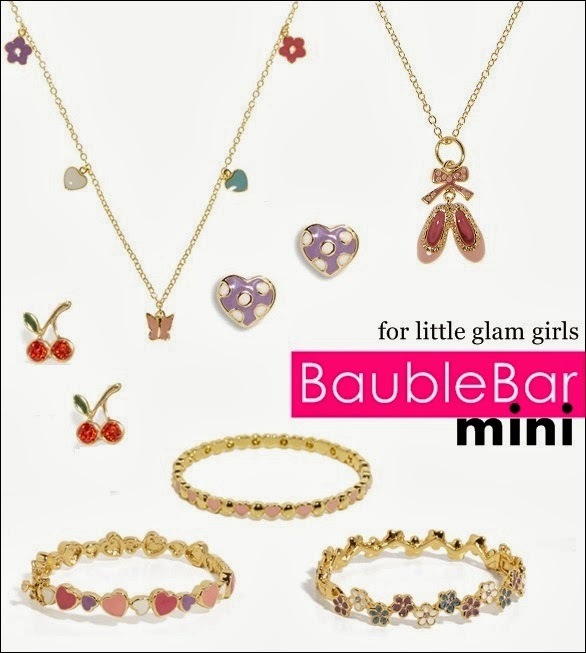 BaubleBar has officially launched a mini collection of tiny treasures for little glam girls everywhere! This jewelry line is sweet as pie featuring necklaces, bracelets, and earrings in the daintiest hearts, flowers, butterflies, and ballet slippers - perfect for your mini fashionistas! All products are 14KT gold plated, sterling silver base, hypoallergenic, and prices range from $12-$30. BaubleBar was kind enough to send Arianna their Pink Polka Dot Bracelet and their Heart Charm Bracelet, and she and I both looooved how cute and delicate they were! She couldn't wait to wear them, so I snapped a few pics before she went to school. Take a look! What do you think of BaubleBar Mini? Do you like their selection? This is so darling! I'm happy you like the pieces, Arianna looks so cute! So sweet! Love the selection and the color combinations really fits her. Adorable! Love her purple sneaks too!